A variable placed in the Rows or Columns lists may be binned, providing that the variable contains only integer data. Binning refers to grouping the individual values within a specific variable. For example, a variable containing reaction times might be binned in order to analyze reaction times in groups of 100 milliseconds. 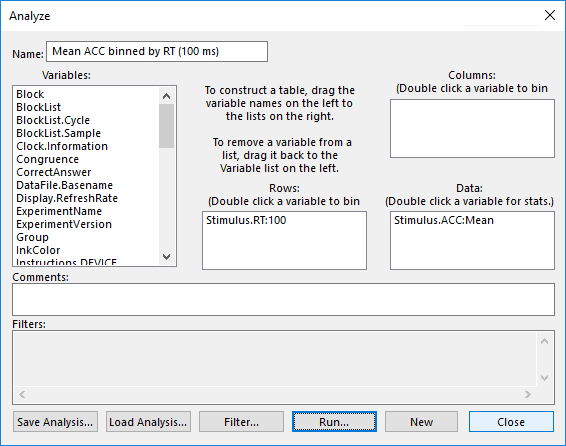 Double-clicking the variable in the Rows list or Columns list displays the Bin dialog. 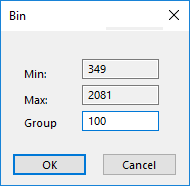 The Bin dialog displays the minimum and maximum values for the variable, and contains an editable field (“Group by” field) in which the user may specify a positive integer (1-32762) by which to group the variable’s values. By default, the “Group by” field is set to 1, indicating no binning. To designate a binning value, enter the value in the “Group by” field, and click OK in the Bin dialog. After exiting the Bin dialog, the binned variable (in the Rows or Columns list) will display the name of the variable with the binning value after it.